Desperately Seeking Adventure: Wuchang: Libraries, Parks & Street Life! So, it's safe to say that Wuchang called me back two weeks ago or so, I adore this part of Wuhan city even though its changing. After seeing my first throw of sights and smell's during the first few months of living here, I came back to see a hint of university life and a place that took me back to a sweet first encounter. 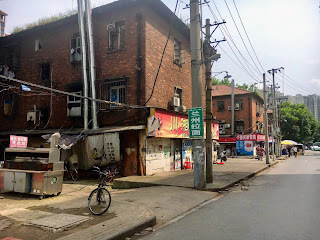 Yes, I found a new love for Wuhan's Wuchang District! 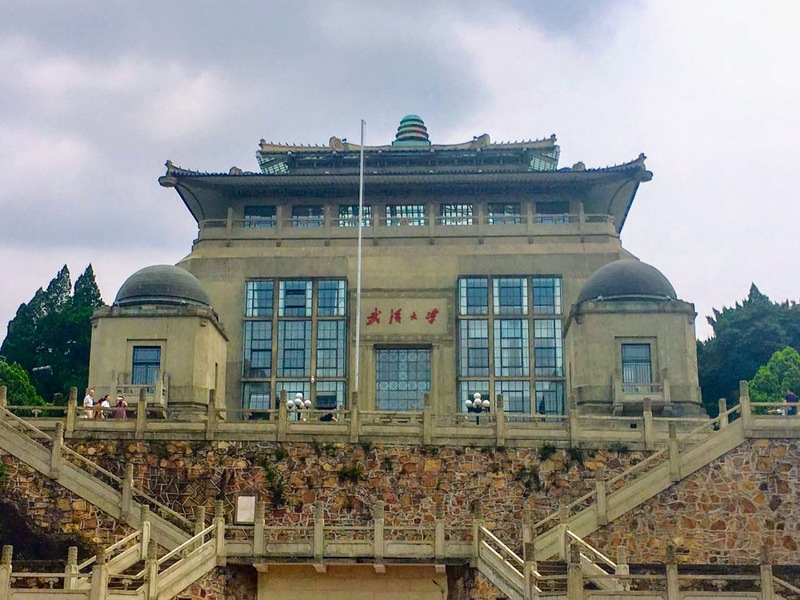 Wuhan is most certainly a university city with its different faculties and large student population. I ditched the others I was willing to check out the grounds of Wuhan University, undoubtedly the most recognisable house of knowledge in the city. With a random Monday off work during June because of a campus closure I decided to rock down to see the famous library of Wuhan University. As I tried to reach the library in-question I got lost within a leafy green surroundings that gave a certain shade from the humid temperatures, the rain came and that as per usual was typical of a Wuhan summer day. Tracking the library down at long last I was fronted with a see of graduates, adorned in their gowns, all posing for their final group photos of their university careers, I had seen a sight like that before in Wuhan but the city's major uni gave me a better view even if the weather was bad. Wuhan University looked great! Aside from library at Wuhan University I was actually looking for a grand historic building that overlooked a normal looking running track. Google Maps is a no-go here so I gave up the ghost during my first visit because that Wuhan rain was giving me hell, determined as ever I had a duty to return. With my head in the game I followed my Baidu Maps app, watching closely for the twists and turns and the obvious Chinese road signs I found my desired location in the end. Spelling the Chinese for Wuhan University that building exuded a sense of oriental flavour but somewhere told me I was looking at a European ideal. Famed for its Sakura Blossom I dodged that time because the crowds get too much, choosing a quiet Sunday I found what I wanted even if it was second time around. 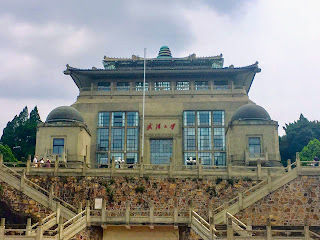 Dating back 124 years since its opening in 1893, Wuhan University's grand buildings fulfilled a Wuchang vision of mine! From the Yellow Crane Tower to 1911's Uprising Memorial, I knew that Wuchang had more in-store! Taking a random turn I turned to Hongshan Park for a quick moment, I couldn't deal with the humidity at all so I wanted the next part of my Sunday to be shaded. 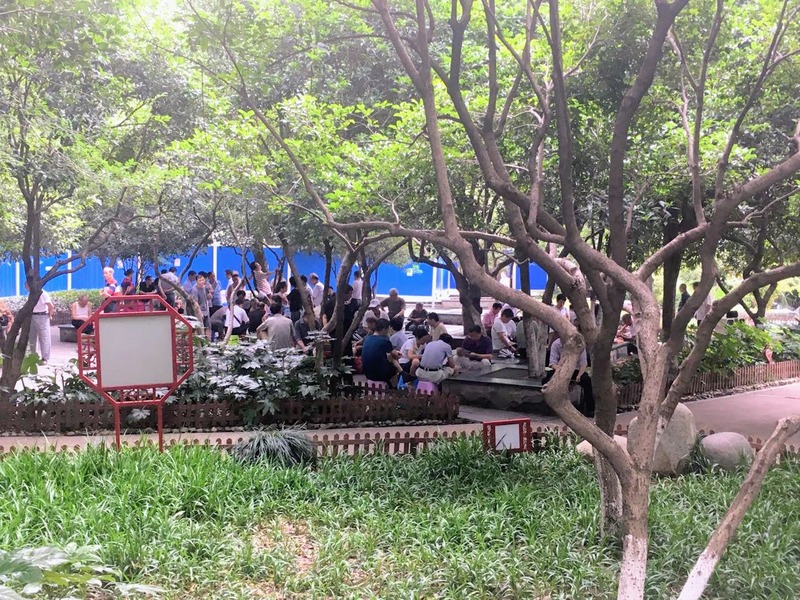 Situated next door from Baotong Temple, I found Hongshan Park to be a hidden gem if not a really random part that didn't take up too much of my time. 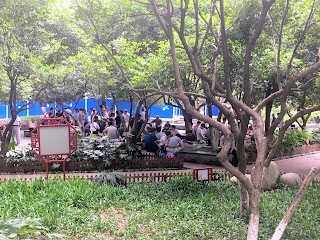 Entering into the parks lush surroundings I spotted a group of older Wuhanese people all congregated around some tables, they looked as if they were playing Mahjong, a Chinese board game that's popular with Wuhan's army of Grandparents. I didn't want to pry or be rude by staring because that would of made me a hypocrite and I'm definitely not one of those things! Wuchang's secret park had a lot to show me but I was just so hot and bothered, plus I wanted to get the most out of my Sunday afternoon by not hanging around in one place. Mahjong may not be for me, those seniors sure looked occupied though! Compared to my first stab at discovering Wuchang, am I more streetwise and less worried about getting lost? During my most recent experiences in Wuchang I had more of an idea for sure about where I was going. The first time around I was stupid enough to look at a Google Map and take it for the truth, that was a mistake as the Changchun Taoist Temple was enough to find but it took me a second time to reach the Yellow Crane Tower. The formidable Uprising Memorial of 1911 was literally under my noise as I realised that during my second Wuchang day that took me to the Yellow Crane Tower with an added stop around Hubu Alley but the summer heat stopped me in my tracks, that food street smelt less than savoury. In control and aware of my environment I found my second instalment of Wuchang to be a finely tuned affair. I definitely see one more Wuchang day out before my departure to England. With Wuhan University and Honghsan Park both seen I had one more place! Turning the clock back to September 2016 I had met a new friend from one of my go to social media apps, we met for barbecue the evening before my second academic year started. Getting to know that new person in my life across the road from a dimly lit food street that looked practically ancient was a special moment. We never went for food along that food street but the view will always stay etched fondly in my mind. It's a sight that always makes me think for a few moments each time I'm on the 703 bus from either Hankou or Hanyang. Taking my head away from a not so distant time I stood in front of that same street but in the daylight it looked exceedingly quieter than I had previously seen it. 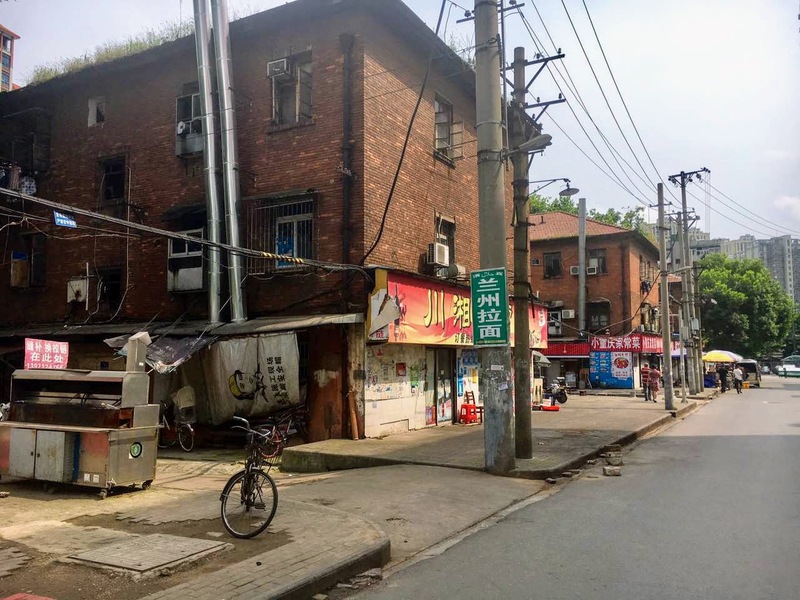 Just to take a little walk along that street gave me life to see those food stalls and restaurants that were anchored by three brick buildings, it was a sight that might be lost as Wuchang is moving forwards fast! Oh my life! It's quite funny because next to that food street became a familiar location during the autumn season of 2016, close to Dingziqiao I spent a fair bit of time with a that new friend that joined me for barbecue. It was a time that took the first part of my second year in Wuhan into a new direction. From chilled weekends to checking out the breakfast places around the area, it was lovely! But sometimes things just aren't meant to be. I'll always have a place for this area of Wuchang because it harbours a sweet memory for me and who honestly can't argue with having a bit of happiness? Let us take a second to be honest with ourselves! My second instalment of Wuchang may have been in two segments like back in 2015 during my first tender months since moving to Wuhan, China. 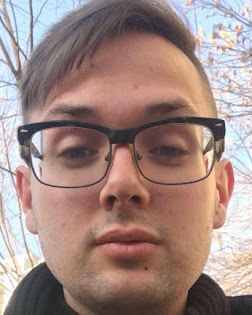 Things couldn't of been any different because I was aware of where I was and no I didn't get lost or trust any questionable maps. I'm sensing a partial throwback for the third slice of my Wuchang chapters!